The following review first appeared in the July 2013 issue of Eric Nemeyer’s Jazz Inside Magazine. 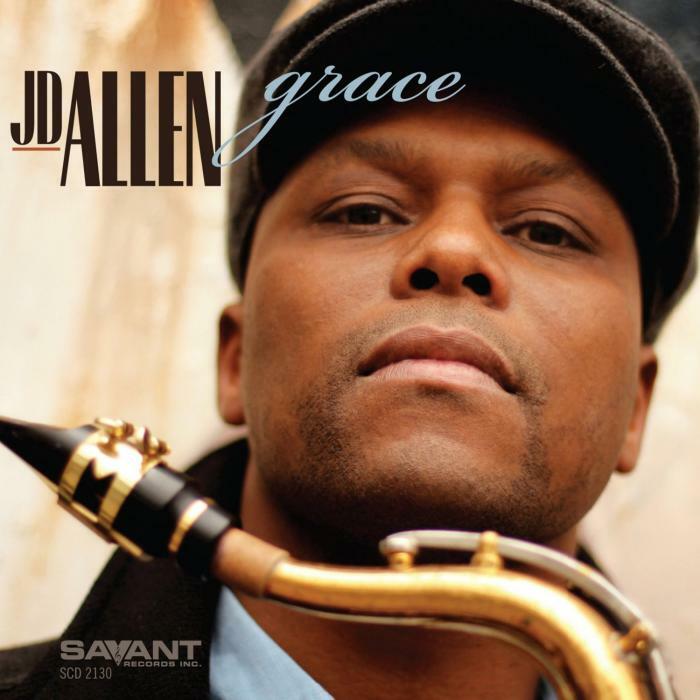 On Grace, his seventh album as a leader, saxophonist J.D. Allen has made a few changes. He has a new bassist and drummer with Dezron Douglas and Jonathan Barber replacing longtime cohorts Gregg August and Rudy Royston. He also has expanded the group from a trio to a quartet with the addition of the celebrated young Russian-born pianist Eldar Djangirov. What thankfully, has not happened is a change in the quality and style of the music. Douglas and Barber have fallen right into place as if they had been playing alongside Allen for years. And Djangirov has done something that many pianists cannot, that is, blended with the group’s musical style rather than alter it. Allen has been recording without a pianist since 2008. His output over that time period has been consistently good; marked by his inventive bursts on the tenor on tunes that averaged about 3 ½ minutes. His discs were high energy affairs that stretched the boundaries of tradition to their breaking point without bursting them. I find him to be the best sax player in the trio format since Sonny Rollins. But if you’ve got to add a pianist, young Mr. Djangirov proves to be the one for the job. I had my doubts since in his own recordings, Djangirov has so far shown a proclivity for playing long albeit technically impressive solos designed to display his speed and dexterity. Fortunately, he has brought those tendencies under control here. He gets where Allen is going and he then enhances what is happening. Djangirov solos are relatively brief and pointed but no less striking than those in his solo work. The pianist appreciates that less is often more and when he is not soloing, he is as likely to lay out as he is to comp behind Allen. The result is an exciting young group with a sound that recalls the Classic Coltrane Quartet circa 1965, just before their breakup. Allen, like Trane, is at times almost begging to go “out”. Djangirov, like Tyner, is helping to keep the saxman grounded and Douglas and Barber create incredible rhythms. The result is exhilarating for the listener, with very little excess. Tracks still clock in at an average of 5:30. There has been a little expansion for the additional instrument but Allen and company still manage to avoid the self-absorbed meandering that plagues many of today’s recordings. The selections, all Allen originals, are divided into two “acts”, as if a play or musical. Though the liner notes explain the significance of each composition to the overall “narrative”, I never got the feeling that this “story” was essential to the performance or the subsequent enjoyment of the music. Grace is a fine piece of modern jazz, whatever the back story. I did have a number of favorite tracks; “Chagall”, a piece which moves around skittishly as if it is one of its namesake’s paintings come to life. I love Djangirov’s comping here, which recalls McCoy behind Coltrane on “My Favorite Things”. “Luke Sky Walker” featuring some energetic playing from Allen as he is being “chased” by Djangirov is also strong. “Cross Damon” which with its mournful beginning, suggests Coltrane’s “Alabama”, before Barber kicks it into high gear and Allen joyfully follows his lead; as if to say “the time for mourning is over, let’s celebrate”. Barber is a terrific young drummer. I had never heard him before this album but I will pay attention from now on. “Papillion 1973” is a favorite for two reasons: Djangirov’s solo which is one of his strongest on the album and also that it evoked memories of one of Steve McQueen’s finest performance on film. Finally, “Selah (My Refuge)”, is the most traditional piece on the album. Allen’s tenor is bluesy is gorgeous and Djangirov provides appropriately understated counterpoint. It’s a calming place to come and reflect after being taken on an exhilarating ride.